When I work with someone, and we start developing the plan they’ll implement to get out of debt, they’re usually shocked that the method used is centered around savings. Most people just naturally assume you’ll just start diving into paying off debt, and that the savings aspect will come later down the road when more cash becomes available. 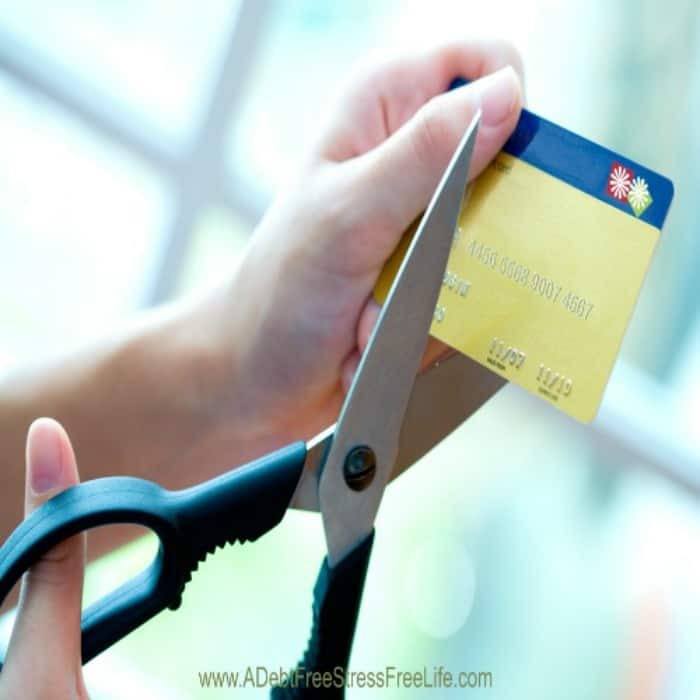 Stop using your credit cards is the first and most crucial step for getting out of debt. You must stop using credit cards and not incur any more debt. For some of you this will feel very strange and for others, it will be a big fat old feeling of relief. To help you see the light at the end of the tunnel, imagine for a moment a time in the future where something happens: the car breaks down, the furnace needs repair, and you have the money on hand. Eventually, this will happen for you, but you must stop using your credit cards. There are different kinds of savings accounts. Some you should leave alone and some you can use. Your emergency fund is the type you’ll use. Your emergency fund is the single most important savings account you have for making sure your debt remains stable and that you don’t incur any new debt. Most people get into debt because they don’t have savings available to them when life happens. Your emergency fund is the account you’ll go to for those nonmonthly expenses that come up that need to be taken care of, like new brakes for the car. So, your question is probably, “How much do I put into this savings account?” Well, that’s up to you, but I will say that $2000 is a great goal as most periodic expenses can be covered with that amount. Make deposits to your emergency fund into simple savings account that you can have access to when you need it. Budget deposits to the account each month as part of your spending plan. If you fail to schedule your emergency fund savings, what do you think will happen when an unexpected expense comes up, and you haven’t saved for it? You’ll go into debt by charging it, and you’ll be back where you started. Do you see why saving your way out of debt is the best plan around? There are lots of ways to go about reducing and paying off your debt. Some people like the snowball method and others find a different strategy to accomplish their goal. Personally, I liked the snowball method and used this method myself when I was in debt and working at becoming debt free. Arrange all of your credit card debts from the lowest balance to the highest. Plan to pay minimum payments on all but one targeted debt. Designate an amount above the minimum payment you can apply to this one card. To experience a win as soon as possible, pay the card with the lowest balance first. For example, if you have 10K on one card and $750 on another, pay the minimum on the 1oK and put any extra payments toward the card with $750. When the first card is paid off, you’re going to feel elated – and you should! Give yourself a huge pat on the back. Now, roll the entire amount you were paying on the first card into the payment on the 10K card. You’re paying the same amount each month towards your debt, but the amount “snowballs” until you’re eventually paying the whole amount toward the biggest and last card. So what is a safety net? Your safety net is the amount of money you’ll save to cover expenses if you experience a sudden job loss or illness. If the events of 2008 taught us anything, it was the need for this type of safety net. If more people had adequate savings, we wouldn’t have seen such dramatic foreclosures and bankruptcies. Start small, maybe just enough to pay for groceries for a month or your utilities. Eventually, you will have enough in their to pay the mortgage and eventually you’ll build up enough to cover six months to one year of expenses. How much to sock away will depend on a variety of situations. If you’re self-employed or are more prone to layoffs, you may want to save more than someone with a steady job and little chance of losing it. Only you can decide what amount feels right to you. I have 18 months in my account, mostly because that’s what I feel most comfortable having available to me. Horray! You’re finally debt free. Wow, I bet you never thought it would happen. Well, the credit card companies don’t want you to stay debt free for too long, so pretty soon you’ll be seeing those zero balance credit card offerings in the mail. They’re like a ghost calling you back to spend more money, and it can be tempting. Resist the urge at all costs to open up a new card. Continue using cash and utilizing your spending plan each month. Save for the things you want like a trip to Hawaii – don’t put it on a card and then think you’ll pay if off. Self-employed individuals fall short in this category more often than people who work in jobs and have access to 401K’s and 403B retirement savings plans. No matter whether you are self-employed or working, everyone should be saving for retirement. It’s important. Once your emergency fund and debt are eliminated and your safety net is firmly in place, you can start building up long-term savings and investment strategies so you’ll be secure in your retirement. In 1833, the US abolished debtors prison. That’s right, up until that time people were sent to prison for failing to pay their debts. With the exception of not paying child support and failing to pay your taxes, you can no longer be sent to prison for failing to pay a debt. Nonetheless, debt can often serve and an emotional and psychological prison for many people. Getting out of debt and moving towards financial freedom is the way out – the only way out. You will experience comfort and peace of mind knowing your future is protected, and you’re free from your past.